Setting an agenda for the siblings family meeting about end of life is critical and should be done before the meeting. It is your GPS to success. Here is a case example. I once did geriatric care management for an aging woman who was dying. Her first husband had died a few years before and had immediately married her old high school boyfriend, who had dumped her, 50 years before..
She now had terminal cancer, had a gastric tube and had lapsed into a coma. She had given her new husband power of attorney for health care. He wanted to take her off life support but did not want her to come home nor did he want take care of her himself, with the support of Hospice. The old boyfriend wanted to have her cared for in a skilled nursing facility. A sibling family meeting took place at the hospital with all the step siblings, the new husband and the hospice social worker as mediator. Her blood children wanted her to go home, the place where they grew up, with 24-hour care, Hospice and life support removed. The new husband’s children, her stepchildren agreed with their Dad decision to take her off life support and move her to a nursing home to die, without 24 hour care. The hospice social worker, skilled in mediation, met with everyone, including her elder law attorney, pre the meeting and used those individual meetings to create an agenda. 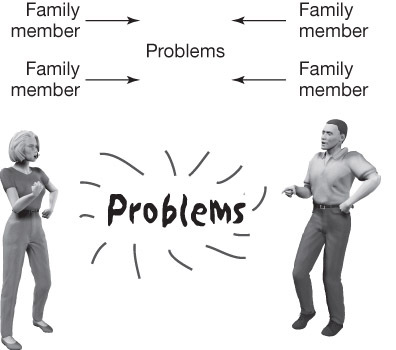 The facilitator or mediator must meet with the older adult and midlife siblings and power of attorney beforehand and individually discuss their point of view about the main problems to be solved, set goals for the meeting and use all information to create the agenda. For example if the meeting is whether to return home to die or go to a facility, then that subject should be discussed in each individual meeting and on the agenda. The mediator or facilitator should also consul other professionals like physicians and hospice case managers or nurses, and elder law attorney’s, if involved, with a release of information, for results from medical tests, legal documents, or other the types of information that may be needed in the sibling family meeting to make decisions and discuss end of life. Any of this information that is pertinent to the goal of the meeting should be on the agenda. When the meeting begins, it is good for the mediator or facilitator to review the meeting goals and to clarify if specific decisions need to be made. The end of the story is the dying elderly woman was moved to an excellent skilled nursing facility with 24-hour home care and Hospice. Life support was removed and she died three weeks later, her blood children at her side. The moral of the story is – do not marry that high school boyfriend who dumped you- and – use and agenda for a sibling family meeting about end of life. .
in an endless war why the sibling mess? If you are Generation X or Y kid who grew up with divorce- did you yourself get divorced? If (bloods, steps and half’s) are heading down the road to writing their own sibling “I Hate You” story, make a summer resolution when the world seems to open. If you are Gen X write a paragraph or two about the generational changes that occurred in your own family (like divorce or remarriage) that might have contributed to the strife between your own children -leading to sibling “I Hate You” stories. If you are a baby boomer grandmother or grandfather watching your children grandchildren reel from divorce-, write a paragraph about how the generational values, both positive and negative, how they had an impact on your children and grandchildren and perhaps how you would like to change them. A sibling family meeting can be organized by one of the siblings who seeks harmony instead of the sound of chalk on the blackboard. The steps you take can make steps, bloods and halves begin to reconcile so that Memorial Day, you might have everyone attend the event with a bit more harmony. Consider unraveling your sibling tale with a sibling family meeting and make forgiveness part of the solution. .